The Marlborough Arts Center at 231 North Main Street in Marlborough is very pleased to announce that Pat Trapp, one of the region’s best-known award winning artists, is offering a one day Pastel 101 Workshop for the absolute beginner, or anyone interested in using pastels. The Workshop will be on Saturday, May 4, 2019 from 9:00 a.m. to 3:30 p.m. in the lower level classroom. Attendees are asked to bring their lunch, beverage, or any snacks. The cost of the full-day Workshop is $75/person. Through demonstrations and handouts the subjects to be covered will include: pastel papers and boards, pastel sticks, pastel pencils, application, fixatives, underpainting/blending, fixing the oops!, and framing/matting. At the end of the session, time will be planned to discuss the demo and the use of oil pastels. Students are encouraged to being any supplies related to pastels. If you are planning to attend, please contact Pat directly by email at etrapp1@cox.net and put ”pastels” in the subject line. The Arts Center is located in an historic building that is fully accessible and has ample parking areas. 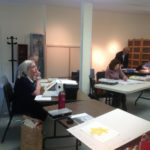 For information on any of the artistic events at the Arts Center, classes, or rentals of the beautiful Charles W. Hall Art Gallery for personal events, check their website at marlborougharts.org. You may leave a message on their telephone at (860) 295-9389 and a Board Member will return your call. MAC is delighted to announce highly accomplished local artist Mary Horrigan will teach two watercolor classes this spring. 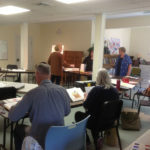 Classes will meet weekly for six sessions each at the Marlborough Arts Center, 231 North Main Street, Marlborough lower level, from 10 AM until Noon. Beginning Tuesday, April 16 – May 21, 10 Am until Noon: Watercolor for all Levels of Beginner lessons will emphasize technique, brush handling, and learning to control and work with this fascinating and sometimes difficult medium. Beginning Thursday, April 18 – May 23. 10AM – Noon: Wonders of Watercolor this is a class for those who have some experience with watercolor, and who want to improve their painting skills. Elements and principles of design will be stressed. Students will be challenged to go beyond their comfort zone by finding new ways of considering subject matter, by trying different colors and painting surfaces, and experimenting with other materials. Over the past 30 years, Mary has had numerous exhibits throughout Connecticut and Massachusetts and has taught watercolor classes for Manchester Community College, Middletown Adult Education, the Guilford Art Center, the Glastonbury Art Guild, and the Marlborough Arts Center. For more information, please contact Mary: mehorrigan@comcast.net, or call 860-295-9362. The $120 fee for each session is payable to Marlborough Arts Center by cash, check or PayPal due in full before or at 1st class of each session. Class registration forms are located on-line at marlborougharts.org Classes section. Jackie Jones will continue her very popular morning classes in beginner oils and acrylics and afternoon classes in all media. Session 1: April 10, 17, May 1, and May 8 at the Marlborough Arts Center, 231 North Main Street in Marlborough. The classes are from 9:00 a.m. – 12 noon and 1:00 – 4pm. The complete set of four classes, either morning or afternoon, is 12 hours in length. The fee for one complete set of classes is $120. 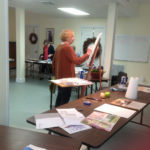 This class is designed for those new to painting. We will make our own black and white 9 step value scale and a color wheel. Next we will practice basic black and white values, followed by color mixing exercises. Lastly we will paint a simple landscape from a, provided, photograph. Note: Although my specialty is oils and acrylics, all mediums are welcome. * Starter art kits can be purchased for an additional fee, if you do not have supplies (email Jackie at jacquelinejonesart@gmail.com for pricing). In this class, students will create a landscape painting using photographic reference (bring your favorite photos or use mine). The goal is to create simple designs with strong foundations derived from a ‘thumbnail’ value sketch. Value, composition and technique will be stressed as well as capturing the feeling of a landscape, rather than just copying a photograph. This class will include an instructor demo and plenty of individual attention. Classes are held at the Marlborough Arts Center, 231 North Main Street, Marlborough, CT. This is a non-profit regional center for the arts and is a fully accessible facility with ample parking.